The enemy in Europe called it the “Fork-Tailed Devil”. We named it the “Lightning”. It was fast and it was powerful. Lockheed, in Burbank, built 9,924 P-38’s which helped to turn the tide of war while protecting America’s shores. By the third year of World War Two industry was producing thousands of aircraft a month. The folks on the home front were working around the clock to give the services the equipment needed to defeat fascism. Yet we see here a brief interlude for two Rosy Riveters, Vi and Selma, as they unpack for an afternoon at the beach. Having finished their shift at the ball turret factory in Anaheim, they have traveled eighteen long miles to Corona del Mar. Their kids can now unwind and play in the shallows at low tide. Military airplanes flying overhead were a common sight, but it was always exciting to see the big birds up close in a low flyby. 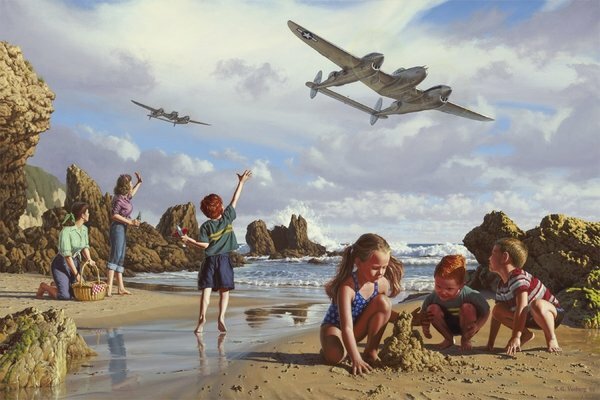 The finishing touch to a sand castle is a worthy work of art, but for one of the twins the approach and roar of two supercharged Allison engines is enough to send him leaping in ecstasy. His brother contemplates the opportune time to destroy his cousin’s masterpiece, while his buddy, Logan, turns to see the errant twin greeting the kindred spirit hurtling through the air. Limited edition of 1,944 prints on acid-free, 100-pound cover stock.